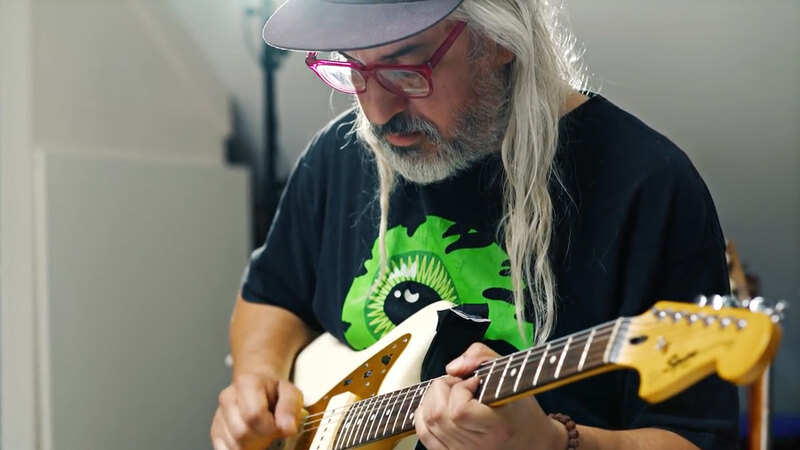 J Mascis, guitarist for influential rock band Dinosaur Jr., recently sat down with us for an episode of our web series, Ernie Ball: String Theory. We love to see and hear each artist’s unique take on music and guitar playing, and J’s is unsurprisingly fresh and unique. Here, we present to you the six biggest things we learned about Mascis, his playing and his background throughout the episode. We’ve provided the timestamp for each segment as well, so you can follow along. Growing up as the youngest of four children, he would frequently listen to his older brother’s guitar-heavy albums. He felt that it was too difficult to play chords, so by stringing several leads and riffs together, he could then plug in some lyrics and have a song. The typography and illustrations looked like “strings for making rock music, not like violin strings or something. He’s always played Regular Slinky, but he prefers his action set considerably high, to the point where others assume the guitar is set up for slide playing. He feels that the action height enables him to bend more easily. When he eventually did gravitate toward the guitar, he thought that it felt “wimpy” and wondered how he could get the same feeling he got when drumming. Subsequently, he plays extremely loudly and wears earplugs so that he can feel the air pressure of the music’s volume. Watch every episode of Ernie Ball: String Theory at our website, featuring such players as Kirk Hammett of Metallica, Dhani Harrison, Joe Bonamassa, and more. You can also enjoy some of J’s most popular songs in this Spotify playlist. J Mascis plays Ernie Ball Cobalt Slinky strings. Do you? Try a set.